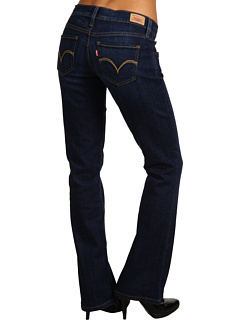 Levi's Juniors - 524 Boot Cut Jeans (Indigo Committment) - Apparel: Accentuate your figure in this fashionably chic Levi's juniors jean. ; Narrow, straight-cut waistband. ; Cut close through the thigh and knee. ; Zipper fly with a button closure. ; Classic five-pocket design. ; Brand patch at back waist. ; Belt loops at waistband. ; Intricately detailed back pocket embroidery. ; Logo tab at rear right pocket. ; Flares below the knee. ; Cotton/elastane. ; Machine wash cold, tumble dry low. ; Imported. ; Waist Measurement: 24 in ; Outseam: 38 in ; Inseam: 32 in ; Front Rise: 7 in ; Back Rise: 13 in ; Leg Opening: 18 in ; Product measurements were taken using size 1. Please note that measurements may vary by size.